At Visually, we are always working hard to improve the user experience on the Visually Marketplace, our cloud-based collaboration platform for creating visual content. Our goal is to make project collaboration intuitive and productive, for clients and creatives alike. Often, companies come to us with more than one visual project in mind, be it a series of infographics, a video and a supporting infographic, a presentation and a series of graphics for social media, or any other combination of the different types of visual content our Marketplace facilitates. As of this week, clients with multiple projects – or project bundles – will notice a more convenient and efficient process, from project start and invoicing to completion and distribution. Once a customer has completed a project through the Visually Marketplace, starting a new one will be easier and quicker, with less work required on behalf of the client. Think of it this way: you will spend less time filling out online forms and providing information or creative assets that you may have already provided for your previous projects. You can now mention (or tag) a specific user in a message on the Project Center. The intended recipient will receive an email message, effectively alerting them that their attention is needed. You can look forward to improved response times and overall work flow. 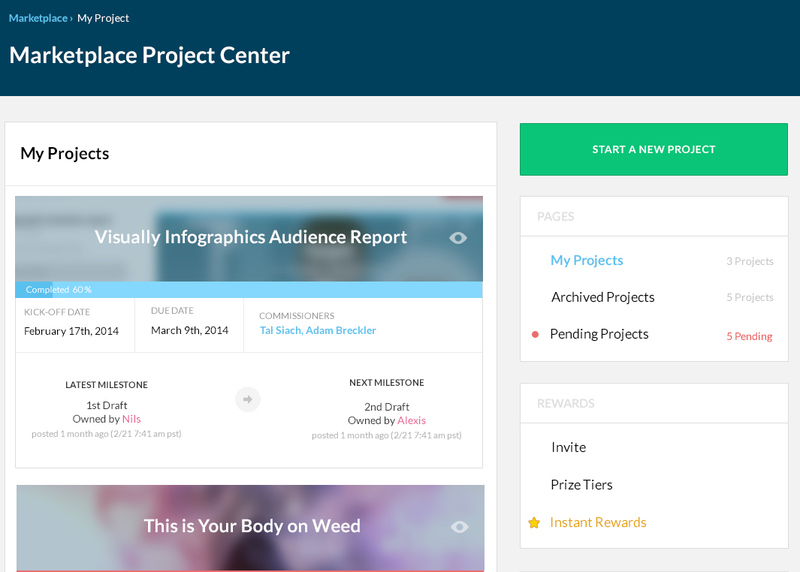 We hope our community of creative talent and happy customers enjoy these new features, and welcome any and all feedback and recommendations on how to improve the Visually Marketplace and Project Center further!